Cupcake Decorating has never been easier! Cupcake Crafts gives you the supplies you need to decorate fabulous cupcakes right in your very own kitchen. 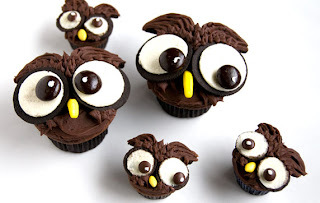 This deal is for (1) one "Nice Hooters Owl Cupcake Decorating Kit. Cupcake Papers, White Accent Frosting Mix, Chocolate Sandwich Cookies, Candy Coated Sunflower Seeds, Candy Coated Chocolates. Banana Flavored Candy, Pastry Bags, Toothpick and Step by Step Color Illustrated Instructions.